New invasive earthworm species discovered in Dubuque and Muscatine counties. DUBUQUE, Iowa — An invasive species of earthworm was recently confirmed in Dubuque and Muscatine counties by Iowa State University Extension and Outreach specialists in entomology and nematology. This species of earthworm, commonly known as jumping worm (Amynthas spp. ), was not known to reside in Iowa habitats until now, although it has been confirmed in nearby states. Dubuque County soil samples with worms were received by the Iowa State University Plant and Insect Diagnostic Clinic, and the earthworms in the soil were confirmed to be jumping worms. An infestation in Muscatine County was confirmed by submitted photo. Jumping worms originated from East Asia and have settled in several states in the U.S. They were confirmed in the neighboring states of Wisconsin in 2013 and Illinois in 2015. The jumping worm is also sometimes referred to as crazy worms or Alabama jumpers. Jumping worm is most identifiable by its vigorous wriggling and thrashing behavior when picked up or disturbed. These worms behave more like snakes than worms. Jumping worms can grow from 1.5 inches to eight inches in length. Identifiable characteristics of the jumping worm include a cloudy-white and smooth narrow band (clitellum) that surrounds the entire circumference of the body. 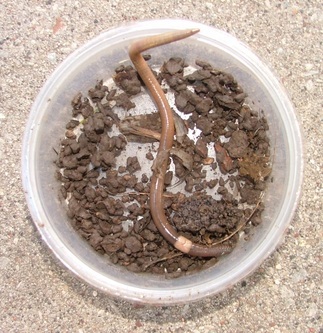 Other earthworm species have a raised clitellum. The body color will be a grayish-brown. Jumping worms do not produce an exterior layer of slime, as do other common earthworms. These worms are also most likely to be found closer to the soil surface and among leaf litter. Soils where jumping worms are present will be grainy and have the texture and appearance of coffee grounds. 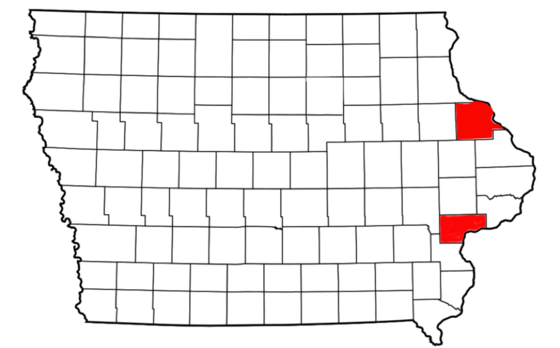 Dubuque County and Muscatine County (highlighted in red) have the confirmed species of jumping worm. Jumping worm can be identified by the cloudy-white, circular clitellum surrounding the entire circumference of the body. This band is flat on the jumping worm, while it is raised on other worms. Photo credit to the Wisconsin Department of Natural Resources Forest Health. Iowa does not have any native earthworm species, so all types of worms are invasive and may alter natural habitats through the consumption of leaf litter and soil. Leaf litter acts as a protective layer of skin on open areas of land, protecting undisturbed land from invasive plants and diseases. When this litter and soil are consumed by earthworms, it exposes the land to compaction, increased water runoff, erosion, and clears the way for invasive plants to take root on the newly cleared soil. This results in less diversity of native plants, and thus less diversity of animals. Jumping worms are able to consume soil and leaf litter at a faster rate than other earthworms, allowing it to out-compete other species. Jumping worms are also asexual, meaning they can reproduce on their own. Jumping worms reproduce more quickly than other common earthworms and may produce two generations per year. Adults leave behind cocoons or offspring, which can survive over winter, making them undetectable until they are adults. The jumping worm life cycle lasts approximately 60 days from hatching. Jumping worms are not regulated in Iowa, meaning no quarantines have been issued. Jumping worms can be spread by sharing compost, mulch, soil and plants. To prevent the spread of jumping worm, do not move compost, mulch and/or top soil from potentially-infested points of origin. Do not move plants from the infested counties and carefully inspect nursery plants prior to planting. If you believe you might have jumping worms, please take photos or videos and, if possible, catch the worm and submit the sample to the Iowa State University Plant and Insect Diagnostic Clinic. To find instructions on how to send a live organism sample, please visit: https://hortnews.extension.iastate.edu/pidc/insect. · Donald Lewis, ISU Extension and Outreach entomologist, 515-294-1101, drlewis@iastate.edu.